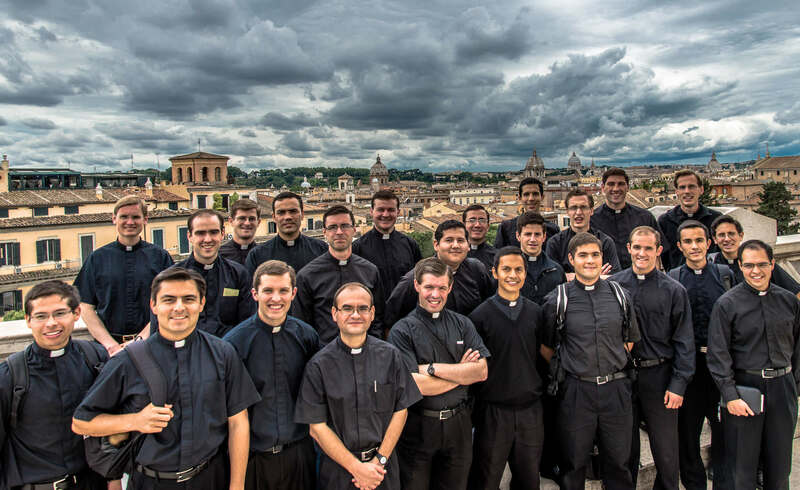 We're religious seminarians of the Legionaries of Christ, and we're blessed to be able to study Philosophy and Theology in Rome, the heart of the Catholic church. There are about 300 brothers at our seminary - located off of Via degli Aldobrandeschi, a few hundred yards from the "Roma Aurelia" train stop. For years we've been helping family and friends transform their experience of Rome into what it should be - a pilgrimage. Below you'll find some helpful tips and information that years of experience have gleaned, and on the next page, if you'd like, you can request a tour with one of the brothers (If we're not studying for exams!). Tha basilica is open from 7:00am - 6:00pm everyday. If you're a large group, they might ask you to pay €1 for headsets near the entrance to the basilica. If you go in the morning, you can attend any of the various masses that are celebrated on the more than 40 altars in the basilica. It's not uncommon to just tag along behind a priest who is going towards an altar to celebrate Mass (of course, it would be polite to ask him if its alright!). Masses are usually in two shifts, the first at 7:15 and the second at 8:00am. You should arrive early to avoid the long line that forms for almost the whole day. We suggest getting advance tickets online, especially if your pilgrimage is during a busy time time of the year (June, July, August especially). You will have to choose a specific time of day to go, but they are not too strict about it - as long as you go on the same day, you're fine. In the mornings, the line can trail for hundreds of yards, while it shortens considerably (if not disappears entirely) in the afternoon. But if you have an advance ticket, you can skip the line. Check the Calendar to make sure it's open when you're planning on going. A tour of the museums lasts between 2.5 - 3 hours. For groups larger than 10, there is a pilgrimage group discount available. 10:00 a.m. on Wednesdays. Also, during the jubilee year of mercy, the Holy Father Pope Francis is holding special audiences on some Saturdays. Check here to make sure there is an audience scheduled during your visit, and here for information on reserving tickets. We suggest arriving at 9:00 (at the latest) to get good seats. You'll want to sit next to the rails in order to see Pope Francis in the popemobile up close. If you or someone you know were recently married, you can request special seating near the pope during a wednesday audience. The only requirement is that the wife arrive in her wedding dress. There is no need for special reservations beforehand, just the regular Wednesday audience tickets. Every Sunday, Pope Francis, after a brief address to the crowds in St. Peter's square below, recites the Angelus prayer from the Papal apartments at 12:00. No tickets are necessary. 5. Holy Door "Walk of Mercy"
You can go whenever you want (according to the time that you registered for, which you can do here). Since it’s a personal thing, you just show up with your family or group and off you go. It starts near Castel Sant’Angelo which is directly east of St. Peter’s, near the end of the Via della Conciliazione, where they have a little tent set up where you begin. If you’ve registered beforehand, they’ll just check your names off on the computer and you can choose whether or not to do the walk with one of the crosses that they give you. The truth is, it’s not absolutely necessary to reserve in advance since you can go to the pilgrim center and register right beforehand (address: via della conciliazione, 7). You can just plug it in to google and it shows you right where it is (a big green door in google street view), There’s a big “Jubilee Year of Mercy” sign out front. If you'd like, you can download an unofficial booklet that we made to make your Holy Door experience more spiritual here. The Scavi (translated as "excavations") are ancient burial grounds located beneath St. Peter’s. It is here where the bones of St. Peter, the first pope upon which the church was founded, are laid. You should reserve months in advance since they only accept a limited number of people each day. Unfortunately, there's an age limit of 15, which they are pretty strict about. 8. The other Major basilicas (St. John Lateran, St. Mary Major, and St. Paul Outside the walls). 9. The Holy Stairs (near St. John Lateran) and the relics of the cross in the church of Santa Croce (also near St. John Lateran). Is there a specific Legionary brother in Rome who you'd like to have for a tour? If we're available for a tour, which would you be interested in? Make sure you check the pope's schedule to confirm that there will be a papal audience when you are in Rome.